Jade plants are long-lived succulents, of the genus crassula, that reach the size of a small, 5-foot tree as they age. Oval-shaped, dark green leaves cover thick stems. Clusters of star-shaped white or pink flowers appear in the spring on mature plants. Jade plants may grow top heavy and need moving into a larger container. Another signal to change plant pots is when you have to water the jade plant more than once a day. The best time to change containers is when new growth starts. Wash a plant pot one size larger than the one it is growing in with soapy water. Rinse the plant pot with one part bleach and nine parts water. This eliminates hiding insect pests and spreading plant disease. Drill holes in the bottom of the container if there are no drainage holes. Mix together one part potting soil, one part peat moss and three parts sand or use commercial cactus mix with 2 cups of compost mixed in. Place 2 inches of the soil mixture in the bottom of the plant pot. Remove the jade plant from its container. Place the jade plant into its new plant pot. Fill the plant pot most of the way with your soil mixture. Firm the soil in around the roots. Finish filling the plant pot up to 2 inches from the rim. This leaves room for catching water without over filling. 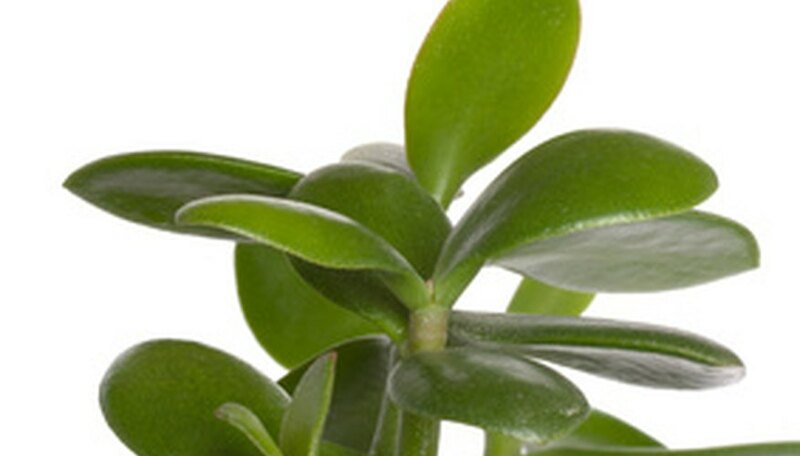 Firm the soil around the base of the plant and check to make sure the jade plant is straight. Allow the plant pot to remain dry for a week. Place the newly potted jade plant in an area with bright light and warm temperatures. Ideally, jade plants benefit from at least four hours of sunlight a day. Jade plants require daytime temperatures between 65 and 75 degrees Fahrenheit and night temperatures of 50 to 55 degrees Fahrenheit. During the winter, move your jade plant at least 6 inches from your window. This protects the jade plant from cold temperatures conducted by the window glass. Do not allow the soil to become soggy since it causes root rot. Pour water into the top of the plant pot until it drains out the bottom. Allow the jade plant to dry out slightly between waterings. Do not allow the soil to become too dry since it will cause dwarfing, spotting, leaf drop and death.